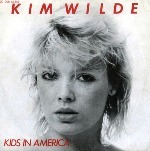 Many children have followed in their parents’ footsteps and in the music business just look at the ‘kids’ whose career was more successful than their parents, both Enrique Iglesias and Miley Cyrus have surpassed their father’s fame, but probably the most successful British female to do that is Kim Wilde, whose father, Marty had 13 UK hits, her mother, who was Joyce Baker and a member of the Vernons Girls had five hit, whilst their daughter has had 30. Marty was 19 when he had his first hit single and Kim was 20. Marty started writing his own songs at an early age whereas Kim was a bit older, but she didn’t have to worry as Marty’s son, Ricky, embraced the art of songwriting and became a pop star himself between 1972 and 1974. With singles like I Am an Astronaut and Teen Wave and charted in Scandinavia. After Teen Wave he joined his father’s band and collaborated with him in writing a dozen of his sister’s hits including her debut, and most successful, Kids In America. Many acts have covered the song most notably in 2007 when The Jonas Brothers retitled it Kids of the Future and included it in the Disney movie Meet the Robinsons. The song was also covered by Len for the movie Digimon and by No Secrets for Jimmy Neutron: Boy Genius. There are a few other versions by bizarrely named bands like Lawnmower Deth, Chaos Engine, The Local Oafs and Naked Aggression. Better known acts have covered it too, Atomic Kitten, The Bloodhound Gang and One Direction are just three of them. Surprisingly, the first cover version of it was recorded in Finland, with lyrics in Finnish. The title was Kaupungin lapset and was sung by Mona Carita. The memorable video was fairly simple and directed by Brian Grant. Kim remembers the experience. “Of course I’d never made a video before and I found it very easy to do. I remember having a connection with the camera, which I found surprisingly easy to do, to watch it and to look at it and to dare it, flirt with it. It came very naturally. I wasn’t trained for that, I just was a natural flirt, I suppose. Brian actually sent someone out to get some wine to get me a little bit… more relaxed (laughs) and I think it did the trick. “Incidentally, the striped T-shirt she wore in it was bought at a jumble sale. In 1996, everything changed. “I was in the business from when I was 20 to 36 years old,” Kim revealed, “And by the time I stopped I thought I would never sing a song again. I did eight shows a week for some time, and I just couldn’t take it anymore. Then I met my husband and thought: Okay let’s start a new chapter. It was a relief, a bit scary, but mostly a relief. Within a few years I got my children and turned my back to the music. And it was really great. I didn’t miss it at all. I loved to raise my children, went to college and learned about gardening. I was Mrs. Fowler and not Ms. Wilde.” She made an equal success of being a gardener and when I interviewed her in 2007 on her way to opening a new garden centre she told me she absolutely loved it. It has since prompted her to get back into music. She released a Christmas album in December 2014 and well as re-recording her 1987 hit Rockin’ Around The Christmas Tree this time with another eighties pop legend, Nik Kershaw. She also hosts a show on Magic with Rick Astley from 10am to 2pm on Sundays.